Learn Kung Fu, make a kung fu movie and more! 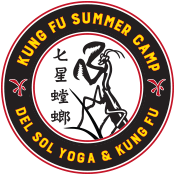 During Kung Fu Camp students learn kung fu basics: striking, kicking, blocking, and weapons training. They will also practice traditional Kung Fu Lion Dancing. Learning the various instruments and parts. Camp goes from 9 am- 3pm, and lasts Monday- Friday. There are four sessions to choose from. Please pack lunch and a snack for your child. We will be there by 8:30 if you need early drop off.